Yesterday I ahem-ed and winked to my Algebra II class about them needing to know how to complete the square for class today. Teaching this topic last year was a nightmare. A total trainwreck. Students were having difficulty all over the place — they couldn’t simplify radicals, they didn’t get why the procedure worked, they were wondering how imaginary numbers came into play here, they confused the steps, they didn’t *get* it. And it was my fault. Part of the problem was that we were doing too much, too fast. We had brought in graphing quadratics early on, and we were emphasizing the relationship between the equations and the graphs from the start. We also — in the middle of the quadratic unit — taught complex numbers. That’s too many huge things to deal with. Quadratics bring too much together, and we needed to keep the ideas and skills organized so they make sense. So the other Algebra II teacher and I decided we’d try something different. First, this year, we introduced complex numbers without talking about quadratics. We motivated these numbers, and then we had students practice working with them, getting really comfortable with them. Second, when we started quadratics, we did so without any graphing. Period. We were doing all algebraic work. We talked about what a perfect square is and noticed a relationship between the four terms — when you FOIL. Importantly, students are going to see that the second and third terms are the same. The next step of creating perfect squares really has them grapple with the fact that the missing constant term is simply half of the coefficient of the term squared. For me, it was this step, just a short distance from the last step, which made the entire unit a success. Because now my students had seen the relationship between all the terms in a perfect square and actually seemed to understand them. My favorite part was that most students were getting problem 10 right — and it involves fractions! We also talked about how important signs are for this process. Before we actually “completed the square” I had students look at the last section of the review sheet. We talked about how if you can write a problem in this form, that you can ALWAYS solve it. And what we were going to be doing is finding a way to write any quadratic equation in that form, so we can solve it. Then I had them solve it, like they had done previously. Most of them had no trouble solving it. They practiced doing a few problems on their own — some which gave “nice” answers, some which gave answers with radicals, and some which gave complex answers. I made them practice a few more times, with some harder problems, and then I threw them a curve ball — a coefficient in front of the term. We conquered that, although there were same difficulties with fractions. Then I put some terms on one side and some terms on the other side (e.g. ). Overall, they really rocked it. How do I know they got it? I started off this post by saying that I ahem-ed about giving a pop quiz in my class today. Well, I followed through on that. gave a pop quiz to my class on completing the square. I gave them one easy problem and one much more difficult problem — with fractions and radicals — on completing the square. I got a whole bunch of perfect scores. This looks fantastic. I love when you can analyze where their problems are and have the time and resources to make the “next go round” much smoother and successful. Go you. Thanks for sharing your experience. Thanks for also providing the 4 worksheets. I will be teaching this topic to my 8th graders in quarter 4. I know it’ll be tough for them. @Ms. Cookie: It’s hard to get the time to do this, and more importantly, muster the energy. At this point, I’m just trying to get the lesson plans ready the night before. You are right to completely separate the topic from graphing quadratics. Saving confusion? A definite gain. But also you set them up for an Aha! later on. No need to spoil the surprise. This is for us a late Algebra I topic. I like using the drawing of the square itself, (x+3) by (x+3) for example, and we can inspect the four rectangles within, noticing two with equal area. Do they remember all of this in Algebra II? No. But it is familiar, and comes back. I know that sometimes all I am doing is setting the stage for learning that will happen in the future. Not a terrible thing. Not a terrible thing at all! I don’t think we have completing the square in the Alg I curriculum, sadly. And I’m glad you think that it’s okay to divorce graphing from this. I have to say that it has been really wonderful — kids that are weak in algebra really got to test their skill with adding fractions, reducing radicals, and simplifying radicals. We’ve since moved onto graphing, and I’ve been surprised how not immediate seeing the connection between the graph and the solution to quadratics are. I’ve been having students solve for example, and then I’m having them graph and talk about the relationship between the graph and the zeros. I’m glad we have time to work on this connection, separately. I’m almost definitely going to ask them a question on their next assessment about that — having them write it down. I ask very few “explain” questions on tests, but this is my favorite group of topics for exactly that. Things that are simple, I don’t care, get a kid to express in words the relationship between an equation and a graph, and you have something they are far more likely to remember. It was on a test a month ago. (Last week, final exam, I just asked for advantages and disadvantages of several methods of solving quadratics. Kids work hard on expressing themselves on that sort of question). @mbork, we’re now done with factoring quadratics… but hopefully someone else who is doing it might find it useful! Wow, when did you teach this to your 6th graders, and is this in your Curriculum? We did not cover this with our 8th graders at my school. I have had previous students contact me that was covering this in high school. @Lcedwards82: I’m teaching this in 10th grade (high school). 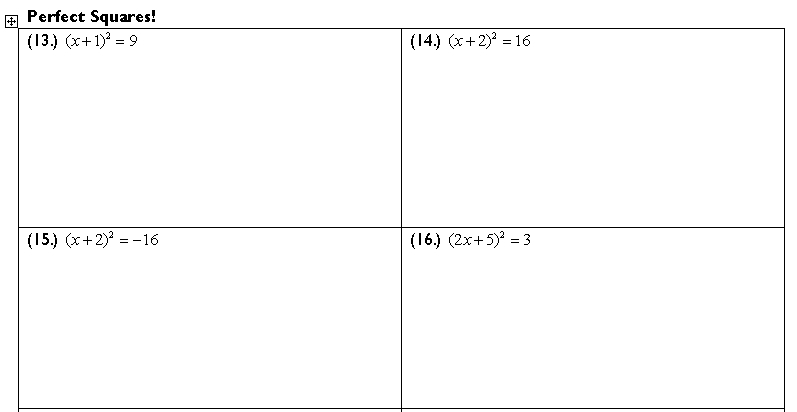 i’m putting together a lesson plan on completing the square and was hoping to cite you as a source in my lesson. i’m a math education student putting together a teacher work sample for a pre-student teaching class. would you be okay with this? i really like your ideas on connecting the second and third terms of FOIL to cutting the “x” coefficient in half. i tried to do this with algebra tiles, but it unfortunately didn’t go over very well, probably because the students had never used them before (it was a group project and my pull for using them in the factoring lesson was unsuccessful). it also could be that i have very little experience and am not that good yet…. I just used these materials for day 1 of my Completing the Square lesson with my Algebra 2s and it totally rocked! We’re on the block schedule system, so I only meet with these kids three times a week. That leaves plenty of room for misunderstandings and distorted memories of procedures to blossom. 1) Right from the outset, it was obvious that at *LEAST* half of the class had only half-understood previous material on square roots and imaginary numbers. In fact, their square root-finding was a little wobbly too, but not as fatally so as their confusion about imaginary numbers. I assigned problems #1-5 as a warm-up. So #1-3 gave allowed me to diagnose and remediate these misunderstandings right off the bat. Students who felt ashamed of not understanding quickly got their sea legs back and were soon jumping in and volunteering to work out the next problem on the board. My skillful remediation was entirely due to your skillfully constructed series of problems to work through. Kudos and thanks for sharing this insight. 2) The next set of problems (#4 and 5) took them to the next level, shifting to a squared variable with an integer coefficient. They could have dislocated an elbow, what with all the back-patting for knowing what to do with the constant term and how to deal with the integer coefficient. Very wily, Mr. Shah. You helped me to lure them right into your trap. 3) As soon as they started working on these problems, they caught a glimpse of problem #6, and there was very nearly a whole group freak-out. But I assured them, Fear not, we will work through the dreaded problem #6 together in a minute, so just concentrate your pretty little heads on #4 and 5. And the miraculous thing was that they did exactly that. 4) Problem #6 could have been a dastardly affair, had the previous problems not been sequenced so cleverly. So after we’d gone through #4 and 5, we did a guided run-through on #6 (you tell me what to do, I write it on the board and ask questions). When they divided through by 5, there was an audible gasp in the room. X-squared equals seven-fifths? WTF? Are you kidding me? Once again, I just calmly questioned them through the process and the problem. When we reached the final answer, I asked them if I was done. A tidal wave of cognitive dissonance hit the room. Positive or negative the square root of a fraction? They were dumbfounded. But it’s not a neat integer answer. How could this be? This led to an insightful discussion about reasons why this might — or might not — be an acceptable answer. I realized that nobody has ever really explained to them that they have permission to find the correct answer exactly as they find it. We made a list of pros and cons as to why this might or might not be an acceptable answer, then we took a poll by a show of hands. By this point, most of the students were beginning to have the courage of their convictions. They honestly couldn’t think of another humanly possible way there could be a better answer than this. A few more hands went up. And then I confirmed their hypotheses that, Yes, this seemingly messy-looking thing — a positive-or-negative-square-root-of-an-irreducible-improper-fraction — is, indeed, the answer that you seek. At least it is in this problem. I cannot tell you how relieved their faces looked after this. The release of tension in the air was palpable. All those years, every time they’ve come up with a messy-looking answer to a problem, they have doubted themselves. They’ve gone back and erased. They’re redone all their computations. They’ve disbelieved the arithmetic. They have struggled with shame. They’ve snuck their cell phone calculators out under the desk and poked in numbers to try and find a better answer. And here it was, staring them in the face all this time. And they figured it out themselves. 5) After that, the class started attacking the rest of the problems on the worksheet with great vigor. We didn’t get through as much as I had hoped originally, but their understanding of the skills and concepts was so much sturdier than it’s ever been that I really didn’t care. I project that it will take us three periods to get through the whole lesson, rather than the two I had hoped for, but I can see that they are already starting to sense what it feels like to taste success in math. Thanks again for some fantastically well-thought-out teaching tools. I’ll keep you posted on developments! For the same reason, I changed #10 to x^2-8x=-15 (original was x^2-8x=12 ) and also to mix things up a little bit (three problems involving x^2 and 8x and 12 were starting to look suspicious to me). Day 2 using your materials went very smoothly as well. This problem set is super well-sequenced. My students were giving me the sideways squint because I kept telling them that many students find this material confusing. I think they really did not believe me. Other students really liked setting up a little “data box” for themselves off to the side, finding the value of b, and then calculating the value of b/2 and (b/2)^2. With those values in hand, it was only a hop, skip, and a jump to completing the square and solving for x. They still need a bit more practice before I give them the “Pop Quiz,” so I made up a batch of equation cards for Day 3 so we can use Kate Nowak’s “Speed Dating” practice structure. I’ve got hard, medium, and easy problems set up. If there is interest, I’ll put the equation cards online on Box.net with the many other fine samples for this practice structure. Please do share your equation cards online. I’d love to try out Speed Dating with them! Day 2 started off with a sequence of four warm-up exercises, followed by the review of my preview material (which doubled as a homework review) and expanded into my introduction to the technique of completing the square. The students were well-served by my introductory material. It drilled them on square roots of positive and negative numbers. This was a gap I was glad I caught early. Their previous coverage of this material was too quick and unstructured to consolidate their understanding. From watching them flail around at the start, it seemed that you can’t just tell a group of 9th-graders something once and expect them to remember it. Moreover, if you teach them something half-assedly, any understanding they do achieve will quickly degrade into a distorted version of what you taught. So the fact that they had learned only that the square root of negative one is simply “i” was already festering away and mutating in their understanding. I learned that I had to get them to know in their bones that the square root of anything is always going to be positive-or-negative something. This fact about the dual nature of square roots is what grounded the class for Day 2 of my lesson — as well as for future algebraic understanding. It’s what is keeping them from coming up with partially understood — or misunderstood — solutions. Day 1 of my three-day-lesson accomplished this grounding, and I felt glad about that. My students are starting to really know this fact cold. If one of them forgets, another one will remind them of it. Throw a square root problem at them now, and they’ll give you both the positive and negative solutions. They do not seem to wobble off their foundation. Even if you throw an “i” at them, they know it could have either a positive or a negative coefficient in front of it. They can no longer be fooled. I like that in a student. This was another aspect of the beauty and simplicity of Sam’s lesson materials. It integrated great patience, building both concepts and skills up one thin layer at a time. It did not confuse or skip steps. For this reason — and because the ones I made up worked so beautifully as reinforcement, next time I will add in a sequence of warm-up problems for each day that spirals back on these same concepts they’ve just seen and worked with— one easy problem involving the square root of a negative number, one problem that leads to a messy-looking fraction, and one problem that leads to a genuinely complicated fractional expression — probably something with a binomial in the numerator and an integer in the denominator. Then I would have them do a problem with a squared binomial that equals a perfect square. And finally, a problem that requires them to complete the square. In fact, I decided to write up those problems and worksheets while they were still fresh in my mind. And so, in a spirit of gratitude for great generosity of spirit, here are the downloadable versions of the materials I adapted and used. These include a Read Me about how I used the lesson, the Student Packet of materials, the Pop Quiz, and a set of equation cards that can be used with Kate Nowak’s “Speed Dating” structure (see http://function-of-time.blogspot.com for details on how to set this up). Thanks so much for sharing this! I had trouble getting to the equation cards, but I realized that your f4th link needs a hyphen between “equation” & “cards”. portion of the file name. There are 4 files in total. The students are still wobbly in their performance of completing the square, but it’s obvious that much of this can be chalked up to testing anxiety (diagnostic tip: when the students gasp, hold their breath until their faces turn blue, and pass out in horror when you give them a quiz you declare will be ungraded, then you can probably attribute their performance problems to testing anxiety). Fortunately, they are all experienced performers (as in the performing arts), so we will be discussing and journaling on test anxiety starting tomorrow as well. In addition, I’ve made up a bunch of new guided practice worksheets — basically, they are “completing the square with training wheels first” practice sheets. They need what one piano professor of mine used to call “opportunities to kill off those nerve endings.” I’m confident that within a week or so, they will all be turning in 4 out of 4 performances. If the beta test of these goes well, I’ll post links for anyone who wishes to take them out for a spin. In the meantime, on to the next batch of skills and concepts! And thank you again for sharing your materials and experience.